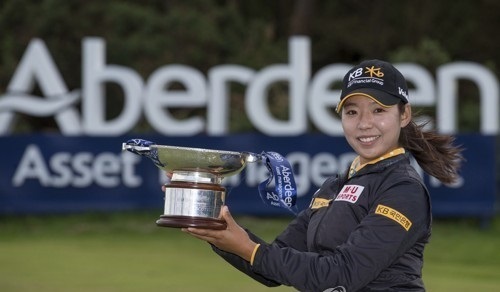 South Korean Lee Mi-hyang has rallied for her second career LPGA Tour win in Scotland. Lee poured in seven birdies in the final round to capture the Aberdeen Asset Management Ladies Scottish Open on Sunday (local time). Six shots off the lead through three rounds, Lee carded a six-under 66 on the last day for the four-round total of six-under 282, beating fellow South Korean Hur Mi-jung and Australian Karrie Webb by a stroke at Dundonald Links in North Ayrshire, Scotland. This was Lee's first LPGA victory since the Mizuno Classic in November 2014, a span of 75 starts. The 24-year-old earned $225,000 for her latest win, and now has $568,013 for the year, good for 20th on the money list. With Lee's victory, South Koreans have now combined for 11 wins in 21 LPGA tournaments this year. She is the ninth different South Korean champion, and also the third straight from the country after Park Sung-hyun (US Women's Open) and Kim In-kyung (Marathon Classic). Lee's rally from a six-shot deficit was the largest final round comeback on the tour in 2017. "It was really a surprise for me, and then just my front nine is amazing, and then I think I got a good start from my first hole," Lee told LPGA.com about her win. "Then just my back nine is a little up-and-down, but I made a lot of putts. I made a lot of good putts and then a good chip shot too." Webb and another South Korean, Kim Sei-young, were tied for the lead at six-under at the start of the final round. But it was Lee who roared into contention by dropping in six birdies, against one bogey, on the front nine. The birdie at the par-four ninth pulled Lee even with Webb at five-under. The Australian Hall of Famer, playing in the final pairing, moved out in front by two with a chip-in eagle at the par-five 14th. Webb gave back a shot with a bogey at the par-four 16th. Then disaster struck at the 17th, another par-four, where she put her tee shot into a bunker en route to a double bogey. Playing ahead, Lee strung together eight consecutive pars before picking up her seventh birdie of the day at the par-five 18th. Webb found herself trailing Lee by two standing at the 18th tee and could only manage a birdie there after her second shot landed in a greenside bunker. The LPGA Tour will stay in Scotland for another week, as the fourth major championship of the season, the Ricoh Women's British Open, will begin Thursday at Kingsbarns Golf Links in Fife, Scotland.